London House, 2001, Hardback in Dust Wrapper. Condition: Good — in Very Good Dust Wrapper. A little rubbing to the edges of the dust wrapper. This copy appears to be the editor’s own copy with many notes and corrections throughout the text, including pagination and layout. From the cover: “Lady Diana Spencer of Althorp and London, tall and beautiful, a lover of music and the arts, treasured by every handsome young aristocrat, earmarked for marriage to the Prince of Wales, damaged by the death of loved ones and destined to die at a tragically early age. Familiar story? 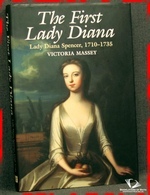 Yes, but this Lady Diana, in a life which was, in so many ways, a mirror-image of that lived by the most recent holder of the title, died at 25 years of age in 1735. The Diana of this deeply researched and truly empathetic biography was the grand-daughter of the Duke of Marlborough. Raised, after the death of her mother when she was only six years old, by a grandmother, she became a young bride for Lord John Russell, who inherited the title of Duke of Bedford.